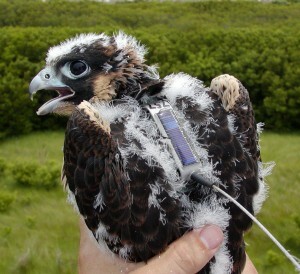 A juvenile peregrine falcon fitted with a light-weight, solar-powered satellite transmitter. Photo by Bryan Watts. FalconTrak was a cooperative project designed to answer questions about the movements and survival of Peregrine Falcons (Falco peregrinus) within the mid-Atlantic region. We tracked 61 falcons between 2001 and 2012 with solar-powered, satellite transmitters to investigate the spatial dynamics of their annual cycle and to identify causes of mortality. Birds included 40 females and 21 males from coastal bridges (20), nesting towers (36), a high-rise building (2), and a captive breeder (3). Birds were either released from mountain hack sites (31) or allowed to fledge in situ (30). We received 66,343 signals of usable quality from transmitters. Movement patterns were used to subdivide the annual cycle into biologically meaningful units. Periods used included 1) Pre-dispersal, 2) post-dispersal, 3) fall migration, 4) winter, 5) spring migration, and 6) summer. More than half of the falcons that survived into the fall period migrated south of the mid-Atlantic region. Individuals did not change their migratory status between years. On average, southbound migration lasted 23 days and birds traveled 3,106 km. Fledging location had a dramatic influence on both migratory route and the location of winter home ranges. Birds that were fledged on the coast were the only birds to migrate to the tropics. Two of these birds crossed over to the Pacific Coast and wintered in Panama and Columbia. Birds from Shenandoah National Park and Harpers Ferry remained in the mid-Atlantic or migrated relatively short distances to the southern Piedmont. Birds fledged from the New River Gorge were the only birds to migrate down the Appalachians and winter along the Gulf Coast. Spring migration was more rapid and direct compared to fall migration averaging only 15 days. Arrival within the summer home range was in May following the first spring migration and in March following the second. Summer home ranges were confined to the mid-Atlantic region and were distributed from Virginia to upstate New York. Five individuals were tracked to breeding territories along the eastern shore of Virginia, near Charles Town, WV, near Baltimore, MD, and on Long Island, NY. Cause of death was assigned to 24 falcons. Of these 11 were believed to be predated, 7 flew into man-made structures, 3 were killed in storms, 1 was hit by a truck, 1 drowned, and 1 was lost at sea. Predators believed to account for the most mortality included Great Horned Owls and adult Peregrine Falcons. Birds flew into transmission lines, towers, a high-rise building, and the side of a barn. The bird lost at sea was flying out over the open ocean and was lost near Bermuda. View the FalconTrak project page.